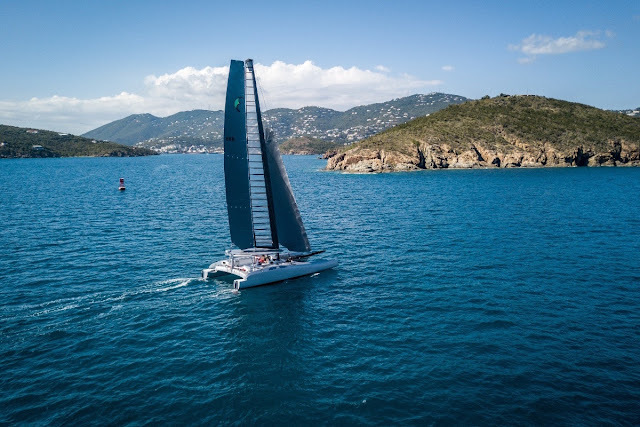 The challenge for the folks at FastForward Composites was to build a foiling catamaran that could lift its hulls above the water, sailing fast and smoothly while carrying passengers and crew in comfort. The Eagle Class 53 is built in oven-cured carbon fiber to achieve a super light yacht with a hybrid wing-sail and either curved c-foils or t-foils, but inside the carbon hulls are twin staterooms with full-sized beds, 6'5" standing headroom, couches for lounging on, and a fully equipped galley with the Viking Microwave to warm up the crew's supper. Wolfgang Chamberlain, FastForward's Vice President and Chief of Operations, gave the NEMA crowd a detailed presentation April 6 on the design and build of the new yacht, which is now in sea trials in the Caribbean with FastForward President Tommie Gonzalez at the helm. FastForward has built foils and other parts for the Americas Cup catamarans, and they have assembled a team of composite builders who put the Eagle together from scratch. Wolfgang took us through the boat build process -- which included acquisition of a huge factory building in Bristol, RI. -- to the launch (which required first that the factory door had to be expanded so that the 28 foot beam could be hauled outside. For many of the NEMA sailors, the hybrid wing sail was the topic of most interest -- i.e., how can it be scaled down for our boats? The rig was designed by Randy Smyth and consists of a lightweight wing that can rotate freely. It is not freestanding but has shrouds and a forestay that attach to a masthead that spins on bearings. The mast also includes a halyard that hoists a more conventional soft sail on a Harken track attached to the leach of the wing. The advantage is that the yacht has the power of the wing but because the soft sail can be removed and the wing can rotate, the rig can remain up while the yacht is on its mooring. Wolfgang patiently answered our questions, although he deflected a few. How much the first Eagle has cost to build was one of those, and the price for yours is yet to be determined, but is definitely in that if-you-have-to-ask-you-can't-afford-it range. But it is an extraordinary sailboat that incorporates innovative designs that will trickle down to those of us whose galleys consist of a Jetboil. And since the Eagle Class 53 is expected in the waters around Newport this summer, we are looking forward to seeing her in action, maybe even strutting her stuff at the Newport Unlimited. Thanks to Wolfgang and Fast Forward Composites for a great event.